The Sunghir site dating to the Early Upper Paleolithic is rightly attributed to the sites of global significance. In 1964 and 1969 the expedition of the Institute of Archaeology, Academy of Sciences of the USSR (presently the Institute of Archaeology of the Russian Academy of Sciences), led by prof. O.N. Bader, discovered burials containing several individuals on the outskirts of Vladimir. 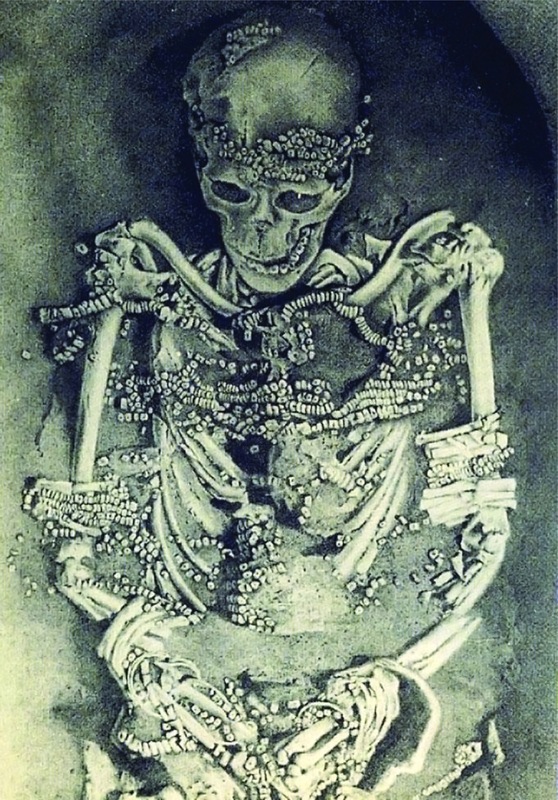 So far the Sunghir burials have had no parallels in Russian and foreign archaeology because of exceptional richness of burial offerings, a very elaborate burial rite and complete human skeletons preserved in excellent conditions. 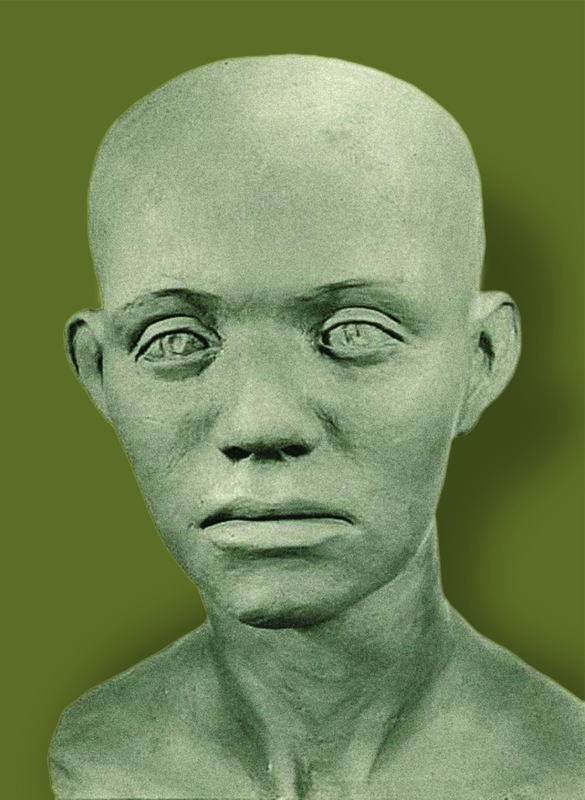 The male burial in grave 1 (Sunghir 1) was discovered in a pit 60–65 cm deep. The dead person was lying in a supine posture, with his head facing north-west. Based on O.N. Bader’s reconstruction, he was dressed in a leather-made garment of the malitsa type, the trousers and high boots reaching his knees. The body was covered with a short leather cape, i.e. a sleeveless coat. The garment was richly ornamented with sewn-on mammoth ivory beads. The grave bottom had been covered with charcoal and ash, possibly, calcined and then sprinkled with ochre before the actual burial took place. When the dead body was placed into the grave, it was also covered with ochre. Another world famous grave revealed by the Sunghir site excavations is a double burial of children in grave 2 (Sunghir 2, 3). The dead were lying in a supine posture, placed head-to-head; their leather clothes were decorated with thousands of mammoth ivory beads and pendants made of polar fox teeth sewn onto the clothes; the clothes were fastened on the chest with bone clasp pins. 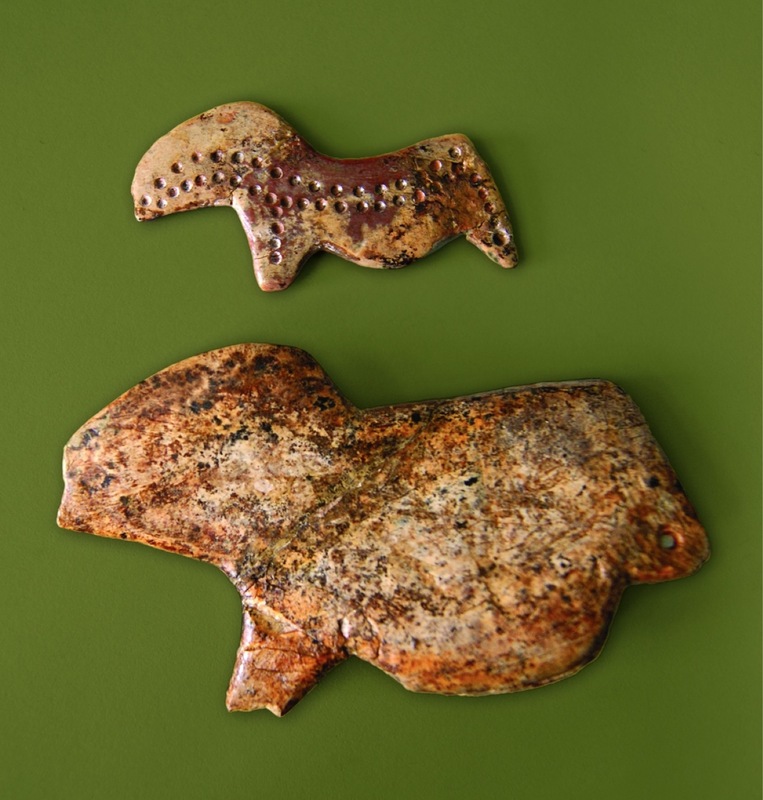 An amulet in the form of a horse was found lying on the chest of the older child, and a mammoth figurine was discovered under his shoulder. Other finds include perforated batons, disks with a central perforation, possibly, related to a solar cult, spears and lances made of mammoth tusk. A lance made of a straightened mammoth ivory, which was 2.4 m long, was placed along the bodies. 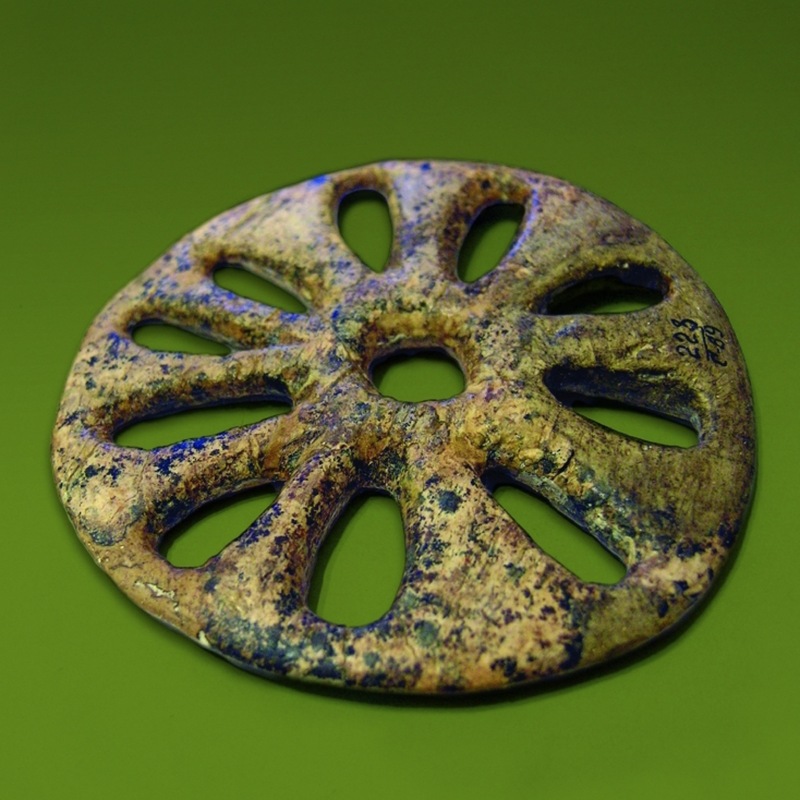 No wonder, these unique artifacts draw attention of Russian and foreign scholars, i.e. archaeologists, geologists, paleontologists, palynologists, and anthropologists. When the first excavations began the Sunghir finds were studied by leading authorities such as geologist and paleontologist V.I. Gromov, anthropologists V.V. Bunak, M.M. Gerasimov, A.A. Zubov, G.V. Lebedinskaya, E.N. Khrisanfova, T.I. Alexeeva. 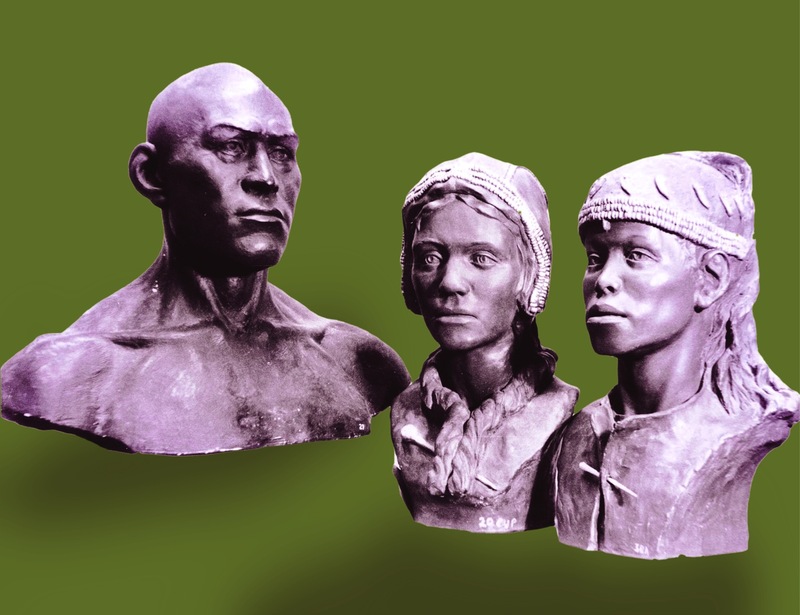 The reconstructed appearance of the earliest humans that lived in the European part of Russia based on anatomic features of the buried persons’ facial skeletons is a lively illustration of this interest. Relying on opportunities provided by advanced methods of studying paleoanthropological human fossil remains, new generations of scholars have been seeking to expand and clarify their knowledge of these populations of Eastern Europe, who lived and died around some 30,000 years ago. In 2014 Oxford University Press published a book, which is the most definitive volume containing actual data on anthropology and bioarchaeo­logy of the Sunghir graves and presenting a contemporary conceptual body of knowledge relating to people who lived in the Early Upper Paleolithic in Europe. What new aspects have been revealed by relevant high technology methods and how has the new knowledge impacted our understanding of life led by the hunters from the most striking period of the Stone Age? wounded in his neck and his cervical artery was injured, which caused his death. Microtomography of the injured vertebra has helped identify the type of the point that inflicted a mortal wound. Microfocus roentgenography and microtomography have confirmed the hypothesis that the death of the boy from grave 2 was caused by a serious wound by a lance that left a mark on the internal surface of his pelvis bone. Synthesis of the research data on the isotopic composition of bone tissue protein has provided an insight into the subsistence system of the Sunghir inhabitants, which relied heavily on hunting for large herbivore. The same method has also suggested that hunt for mammoths did not play an important role in getting access to food resources. 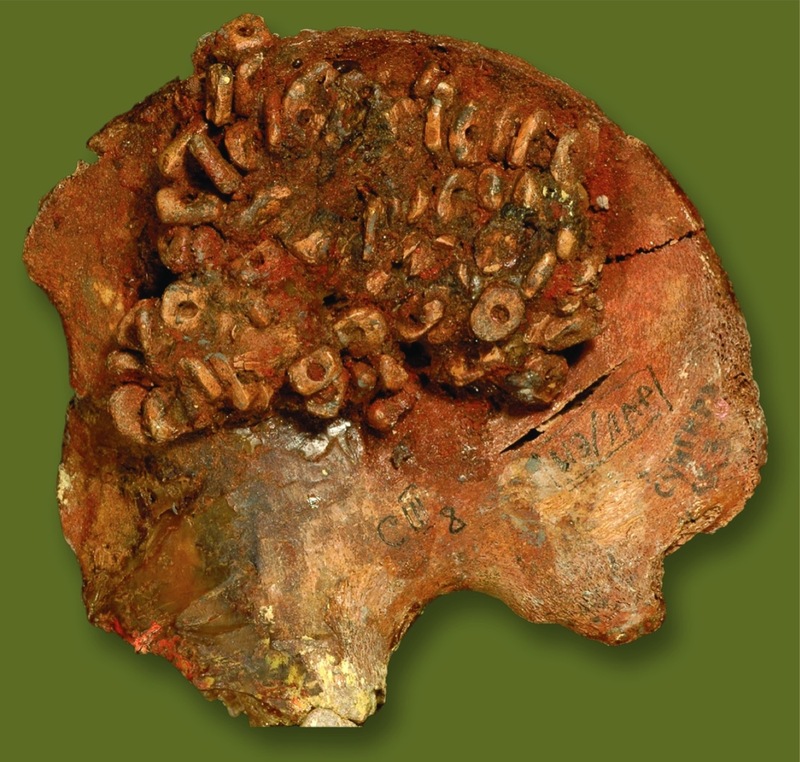 Other studies performed with the use of computer tomography and microfocus roentgenography have clarified the facts of life of a Sunghir male from grave 1. Massive hand bones of this Sunghir man place him closer to the representatives of more archaic humans, i.e. the Neanderthals. Massive bones develop as a result of hypertrophy of the bone tissue due to physical stress; apparently, the man was a hunter of powerful built who made stone implements and actively used them. As a whole, contemporary advanced methods have turned over a new leaf in the studies of the Sunghir finds. Computer tomography and microtomography, microfocus roentgenography, isotopic analysis of bone tissues have helped the archaeologists find answers to many questions as to how inhabitants of the Eastern European Plain lived, what activities they were engaged in, what food they ate, what diseases they suffered from dozens of thousands years ago.